Salt City Summit | Junior League of Syracuse, Inc. 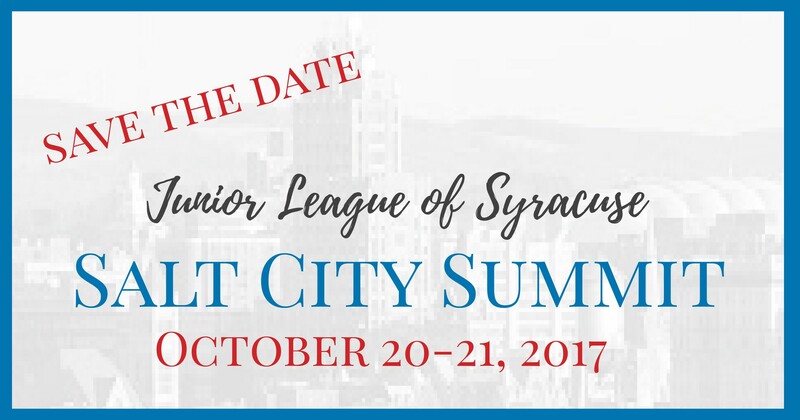 The Junior League of Syracuse will host the Salt City Summit in Syracuse October 20-22, 2017. This Regional Training on October 21 will feature speakers including AJLI’s Amber Levy, Director of Membership, and Lisa Vaughan, Past President of the Junior League of Evansville. The Training will also include a facilitated Sustainer session. All sessions will be interactive and participatory. Additional details on the training content and activities is available on the Salt City Summit schedule page and session descriptions summary. Active, new, and sustaining members of northeastern and mid-Atlantic Junior Leagues are invited and welcomed to attend. The Junior League of Syracuse has been promoting voluntarism, developing the potential of women, and improving Central New York for 95 years and counting. View a glimpse of our history and impact within the greater Syracuse community here. Copyright © 2019 Junior League of Syracuse, Inc.